Mads Møller of Arcgency an Architectural office situated in Copenhagen, Denmark. Has come up with a container house concept as he says is using “Old shipping containers used as the structural framework for the WFH-Huse. 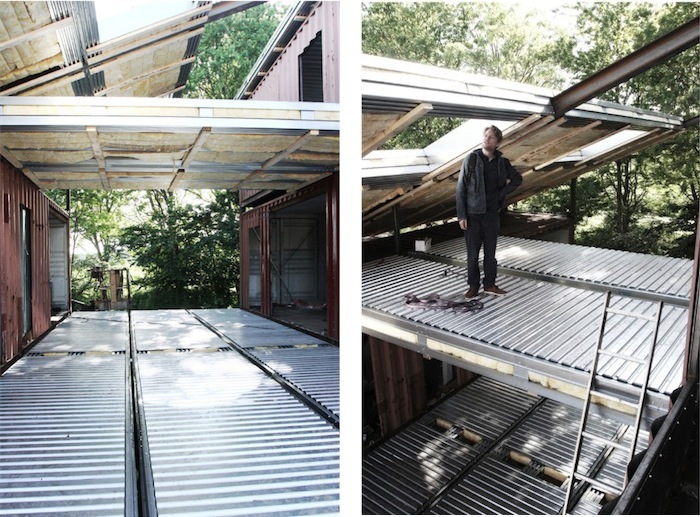 This is not just recycling; This is upcycling!” The WFH concept is a modular concept, based on a design principle, using 40 feet high cube standard modules as the structural system. 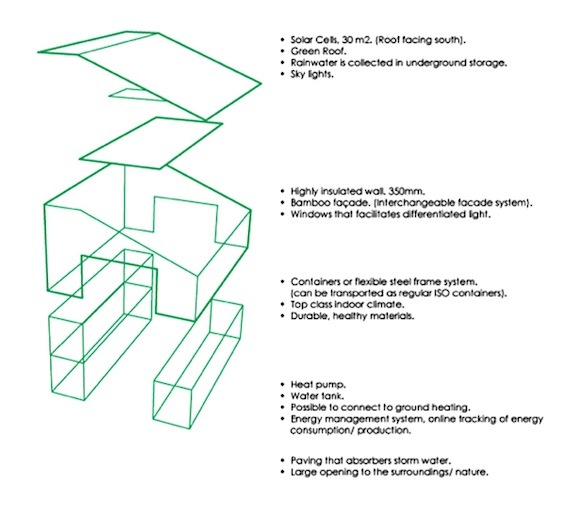 The structure can be adapted to local challenges such as climatic or earthquake issues. Online customization-tools give clients the possibility to decide their own version of the house concerning layout, size, facade, interior etc. The configuration happens within a predefined framework that will ensure high architectural value and quality of materials. Building-components are prefabricated and on site construction can be limited. • The WFH concept is a patented modular building system, based on a design principle, using 40 feet high standard modules as the structural system. • The structure can be adapted to local challenges such as climatic or earthquake issues. • The first prefabricated housing system that meets the demands in the international environment-building-standard, Active House. • The structure can be configured to meet many different purposes, multi storey, townhouses, cluster houses or individual villas. • Top class indoor climate, low energy consumption and environmentally sound materials. • Demountable for recycling or relocation. • Online customization-tools give clients the possibility to decide their own version of the house concerning layout, size, facade, interior etc. The configuration happens within a predefined framework that will ensure high architectural value and quality of materials. • Cost competitive in comparison with other green houses. 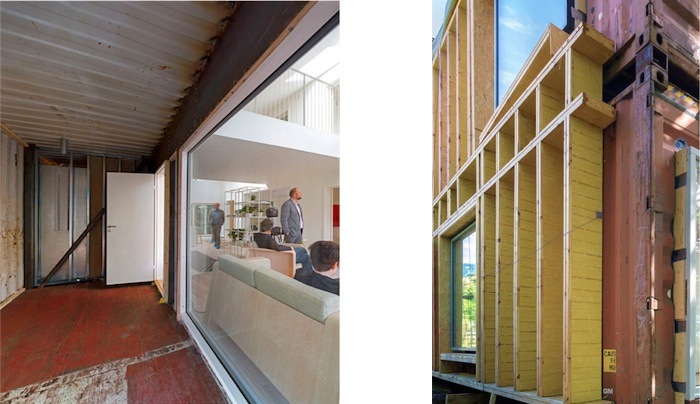 • Building-components are prefabricated and on site construction can be limited. The design allows for high-quality industrial production in large numbers and distribution using standard container transport. 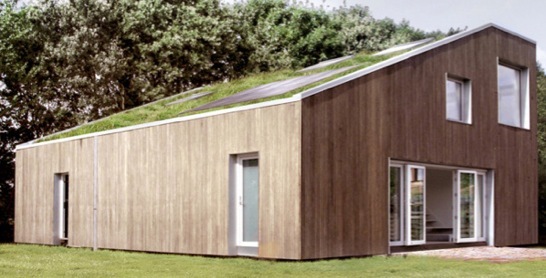 •Energy class, which is 50% lower than the standard requirements for new housing constructions in Denmark. • Photovoltaic cells are integrated – area is flexible, but to fulfill the standards above min. 20 m2 solar cells for power production are needed. With an area of 30 m2 or above a normal household using energy efficient appliances will be self-sufficient with power on an annual basis. • Green roof solutions that are optimized for rainwater harvesting for use for toilet flushing, washing and cleaning. • Build for people, human values. – Good daylight conditions, different types of light. • Reliable (long term) solutions. – Healthy materials, recyclable materials, design for disassembly strategies. • Materials that age gracefully. • Access to nature, greenery. 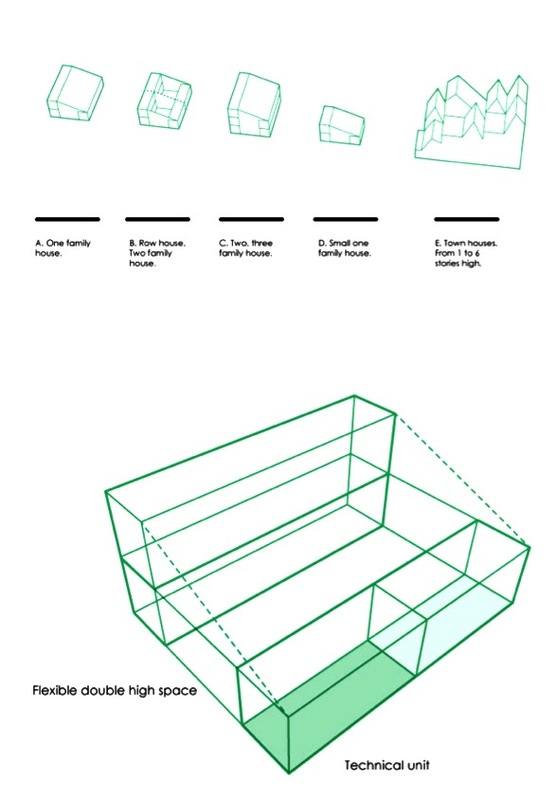 The FLEX space is the heart of the house. It contains the living room, kitchen and can be used for multiple purposes. Parts of the room are double height, creating perfect lighting conditions. 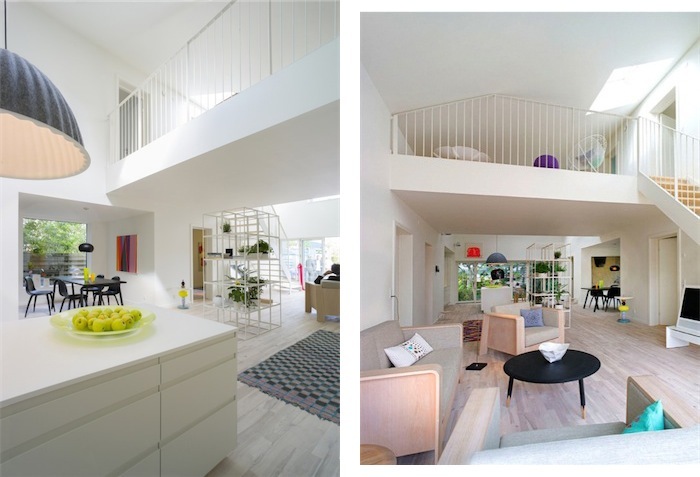 The rest of the space is one story height, defined by the landing that creates access to the spaces on the second floor. 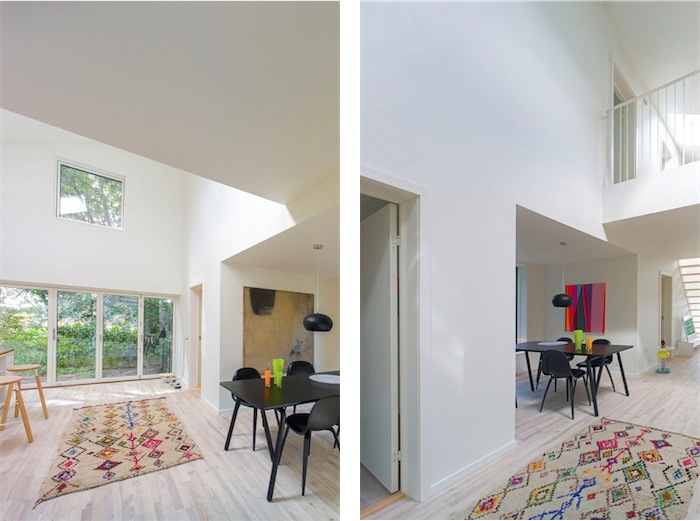 In each end of the FLEX space there is access to the surroundings and daylight. The boundary between inside and outside disappears, when the doors open. This is a fundamental part of the design; to be able to open let nature in. It is a consequence of having varying requirements for inside temperature and definitions of what domestic functions takes place inside and outside. The geometry of the FLEX space is defined by the two rows of modules, and can easily be modified to specific wishes regarding size. The FLEX space has a number of possible solutions for subdivisions. Both on one plan or two plans. 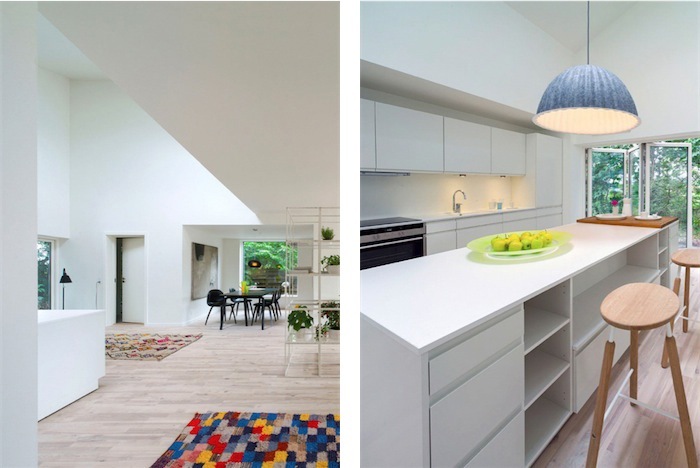 It can also be one big space, creating a lot of light and openness. The kitchen elements are built into the wall (into the technical module). It creates more floor space and also makes connection to water and plumbing easy. The kitchen can also be extended with at freestanding element, defining the work area of the kitchen. From the FLEX space there is access to all spaces. This eliminates square meters used for logistics. It is possible to make larger openings from the FLEX space into the rooms, again creating flexible solutions within the same system. From the FLEX space there is access to all spaces. This eliminates square meters used for logistics. It is possible to make larger openings from the FLEX space into the rooms, again creating flexible solutions within the same system. 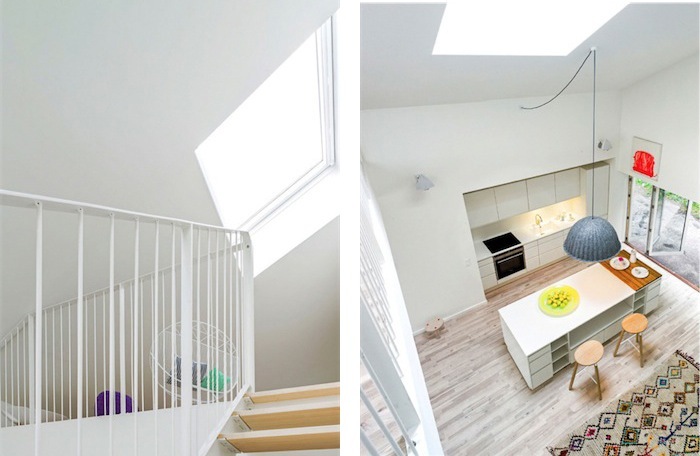 The landing creates access to the second floor, but can also be used as a space for play, relaxation or work. It gives the inhabitant the possibility to draw back, but still enjoy the company of people in the house. You are in the FLEX space, but because you are on the first floor you are drawn back from the action. It is an ideal place for a quiet retreat and still being able to observe what is going on in the house. 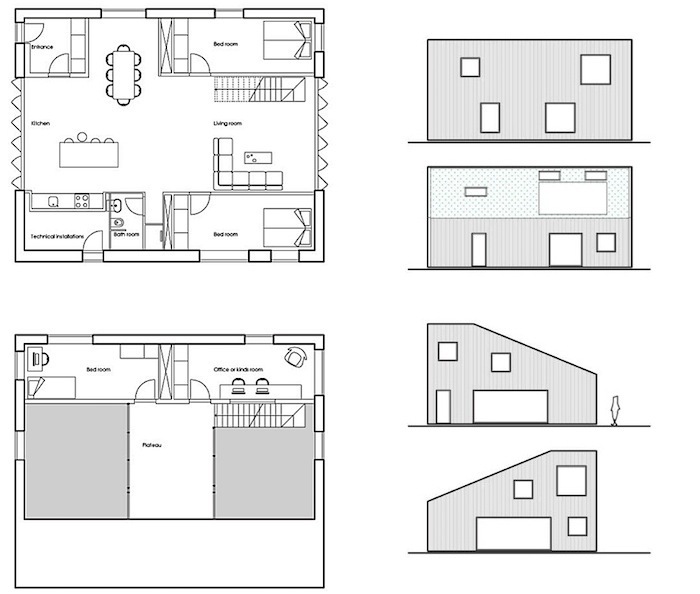 The size of the bedrooms is defined by the half of a module (15m2). 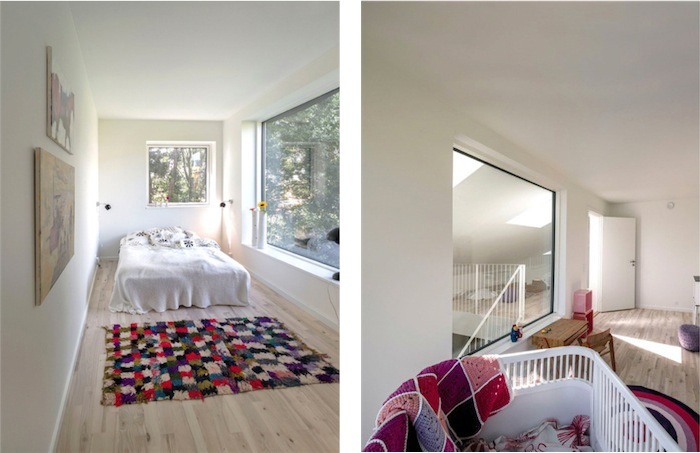 There are four bedrooms, and they can be used for multiple purposes: A parent’s bedroom, kid’s bedroom, workspace etc. Three of the rooms have windows on two facades, creating a mixed light. 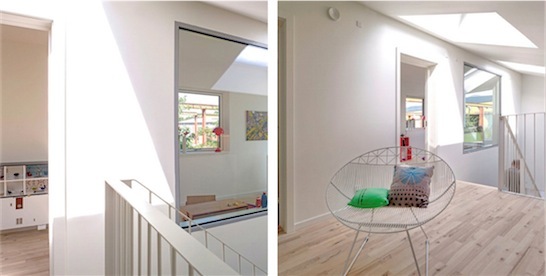 It is possible to remove the wall, or part of it, facing the FLEX space. This adds flexibility to the layout and shows the structural systems ability to adapt do different needs. Can I put up a container home in the Northern Suburbs Western Cape South Africa or sare there restrictions to where one can put them up? Hi Virginia, You will have to get approval of an alternate building method. The best is to contact the planning department of the Cape municipality and ask. A professional architect will have more leverage with the approval of plans for this. Contact one of the architects and ask. 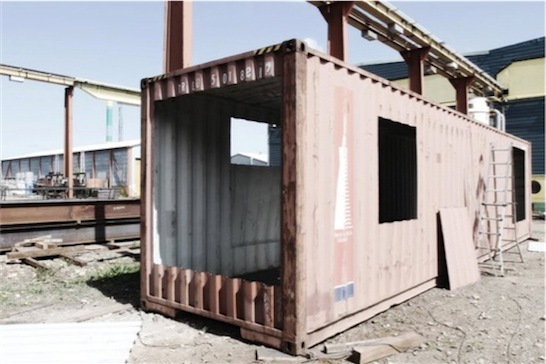 I am interested in building a workshop out of containers. So basically stacking 2 x 12m on top of another to give height, them closing off the back with one single 12m. then spanning a pitched roof over the top, laying a concrete floor. Are there any requirement or specifications needed to go head with this? Would I need building, floor, elevation and structural engineering plans and would one have to submit them to the local town planning section at the municipality? Thanks, your help would be much appreciated. 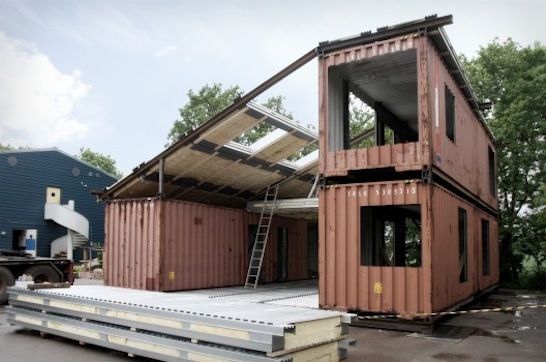 I am interested in Building a container home. Please let me know what is the regulation requirements. You need to follow all the National Building Regs but in terms of The application of the National Building Regulations Part A: General principles and requirements, you will also need an Agrément Certificate that “confirms fitness-for-purpose of a non-standardized product, material or component or the acceptability of the related non-standardized design and the conditions pertaining thereto (or both) issued by the Board of Agrément South Africa.” The Board of Agrément South Africa operates under the delegation of authority of the Minister of Public Works. Hi. Craig here. Would it be better to get an architect involved and let them sort all the costs out? I might have contacts for containers. An architect or some other “competent person” will need to be involved – by law. The fact that you want to build with containers doesn’t change that. Nor does it change the basic requirements in terms of plumbing, energy requirements and so on. Hello my name is jethro I want to no do you build in gauteng south Africa and can a person pay it of . No Jethro we are not builders. This website simply gives information. Sorry no; we don’t do construction work and so don’t provide quotations. Unfortunately we are not in a position to supply prices. You need to find contractors/companies that do this kind of building work and ask them to quote you. I am a contractor that tries to do the extraordinary and out of the box ideas when it comes to builds. I have not built a container home as yet, but have read up on the construction and design of homes that are built with containers. This would be something I would like to get involved with. If you find someone that can do this for you, I’d like to be involved, even just for the experience, maybe get involved with the design aspect of it. Or if you want to take on the challenge, we can tackle it together. We have extensive experience in construction and metalwork, so the construction principles required are solid. Martyn I am not sure about the UK building regs, but I have seen many container homes there. I suggest you contact the planning department of your own local authority for more info. They should be able to advise. If you use a shipping container/s for making a garage, would you have to get plans drawn up and approved before commencing with building them. Also would these be classified as building? Could you please give us a rough estimate quote. about 4 bedrooms two which have en suite bathrooms out of containers. do the conversing, plumbing, gas, electricity, plumbing etc. Hi Jennilee, I have moved your comment to the correct place as we clearly say that the “Contact us” is for advertisers only. This website is called SANS10400 Building Regulations and not Building and Construction. We do not do any building work so we cannot give you a quote. Hi I am very interested in building a container house. What does the building regulations say for SA regarding this? Dawie the National Building Regulations state that if non-standard materials are used for building, you need an agrément certificate that confirms fitness-for-purpose of a non-standardized product, material or component or the acceptability of the related non-standardized design and the conditions pertaining thereto (or both) issued by the Board of Agrément South Africa – and you then build in accordance with the terms of an agrément certificate. The Board operates under the delegation of authority of the Minister of Public Works and I know there have been some changes, so I am not sure exactly what you need to do to get the certificate. Presumably a competent person will be able to help you. Did you ever find out about those regulations? 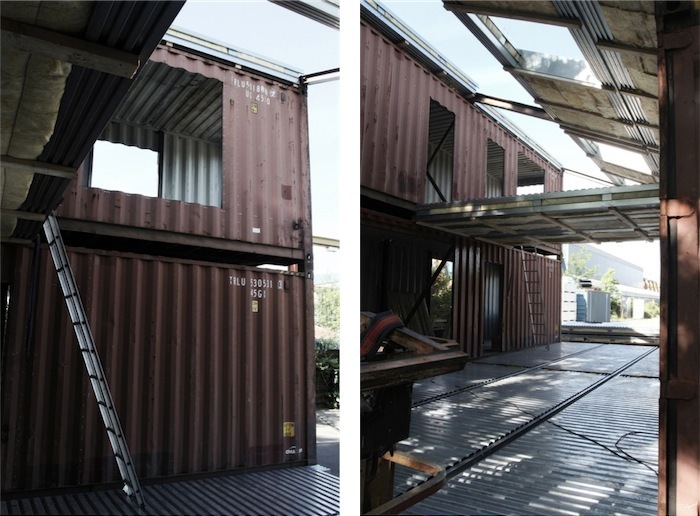 I am interested in building a shipping container house in the Western Cape’s Swartland area, and wonder if it might be a bit of a bureaucratic nightmare. If you’ve progressed this, please leave a comment here. Hi, I love and applaud your idea, and would very much like to build one of these in the UK. Also, in a year or two, I would like to start a housing regeneration project in the Western Cape, South Africa, where there is desperate need for basic shelter for the homeless. Renewable energy systems would be extremely useful, so Townships do not have to depend on government supplies of water and electricity. Please could you give me cost details for a very basic shell, with facility for renewable systems, and also for something more suited to the UK market? I.e, as pictured above. 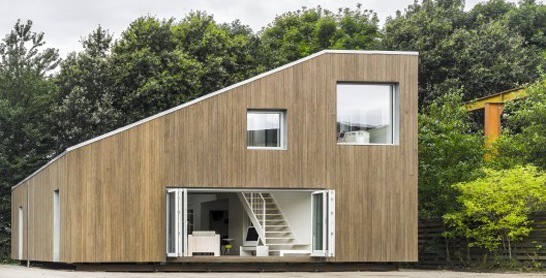 That particular container house system is designed by a Danish architectural firm. The designer is a guy called Mads Moller and he can be contacted here: arcgency.com/21271/contact They do say on the website that the system can be tailored any way you want and they ship anywhere in the world. As for the next part of your comment, I have lived here in the Western Cape for 30 years so I am familiar with the bureaucracy in this part of the world. You might face an uphill battle to get your project off the ground. Having said that, this is the best province in South Africa to start somthing like this. Good luck, and please keep in touch and updated with your progress. Hi, I love the design of the container house and would like to know more, however I get the idea you are not from South Africa. Can you let me know as soon as possible. I’d like the price also. Hannes the article is about a business in Norway and there details are at the bottom of the story.